The last post I covered, in detail, the genesis of Gumbinnen as the original and very first sendai design I had created in the 90s. 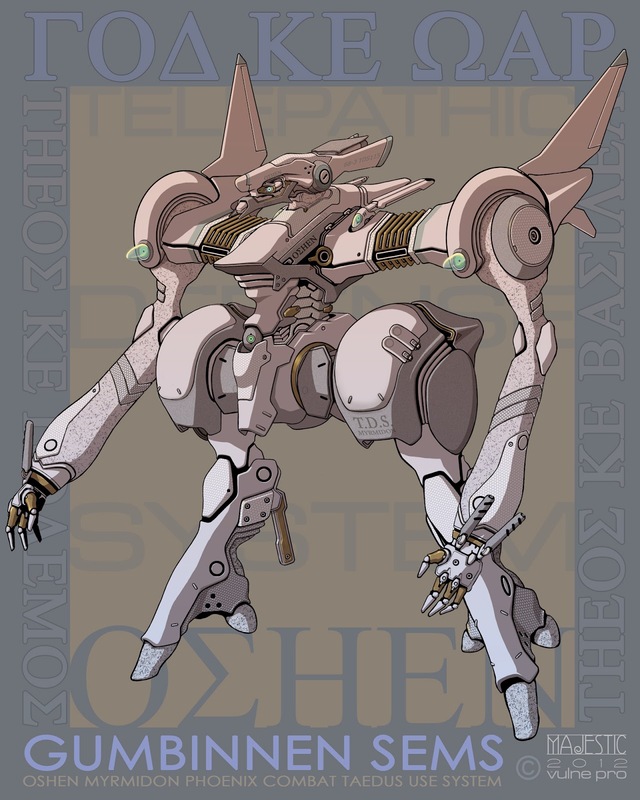 The creation of this character being of note because it was the first design to spawn all the ideas that would evolve into the sendai that populate the settings of Theos KE Polemos. 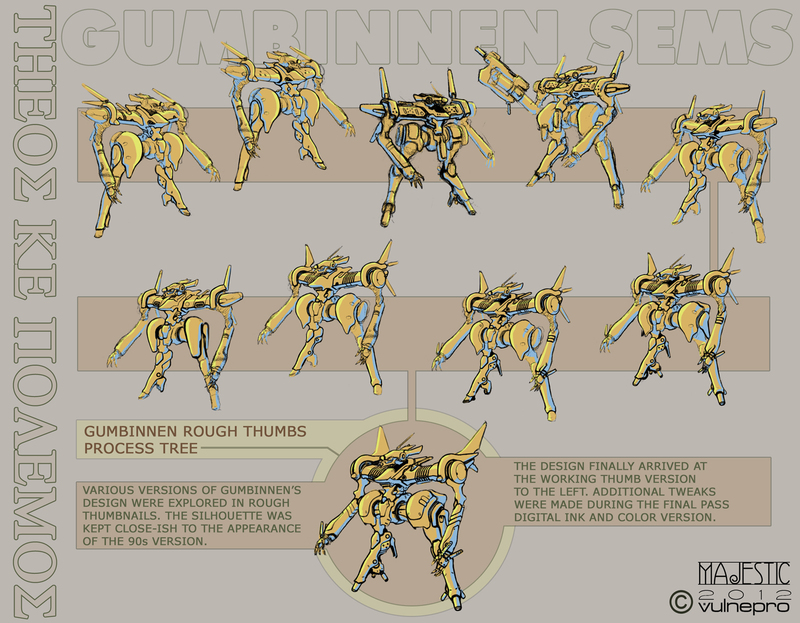 With this post we're going to cover Gumbinnen's make-over into the current visual aesthetics TKP is known for. 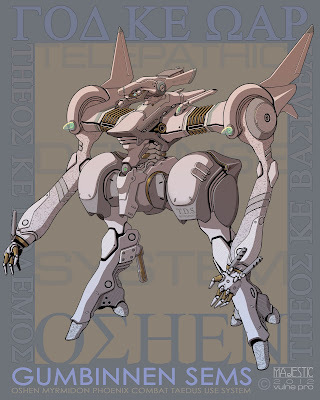 Most of you following the Theos project, whether on Deviant art, tumblr, Pixiv, or here are likely more famlilar with the FOILs than their smaller brethren the sendai rank and file. That began to gradually change in 2010 when more examples of the sendai, primarily examples of those populating the industrial planet Indus, began showing up in the Vulne Pro Deviant art gallery. It was late in 2010 I had begun planning to explore the material that was originally Beyond Reach in some greater detail, those explorations became Badan Song. With Gumbinnen being a major character in this material it meant revisiting the old design for a TKP make-over. I began working on a first pass in October along with plans to begin preliminary work on this material. The early Photoshop grayscale paint is below. The first pass at a new Gumbinnen went unfinished... my Father would have an accidental fall the following month (on Thanksgiving of all days) fracturing his arm and kicking off an entire year (2011) of medical issues. Needless to say Badan Song, Gumbee, and pretty much everything had to be shelved. I had zero problems with putting the work, studio, and freelancing, on the back burner. I'm glad I could be there to spend that year taking care of my Father, it's because I did so he's doing well today. 2011 was a long year in and out of doctors offices and hospital rooms, extended care, etc. so my focus was on navigating all that and doing what I could for my Father. Amazingly he came through every challenge extremely well so by the end of the year things began to stabilize and I could both work again and keep an eye on him. Gradually things got back in gear. Once 2012 kicked off I knew I'd have a juggling act of work and keeping an eye on my Father. With things going reasonably well, under the circumstances, the plans are to pick up where things left off in 2010 and return to a more productive schedule again... because those damn Mayans are coming with their UFO fleet of doom. These wily ancient-alienz-über-apocalypto-doom bringers are intent on cracking the Earth in twain, thus spilling it's rich nougaty center. How the Mayan's covet our nougat. Mayan jokes not withstanding we do have some interesting things planned for this year. 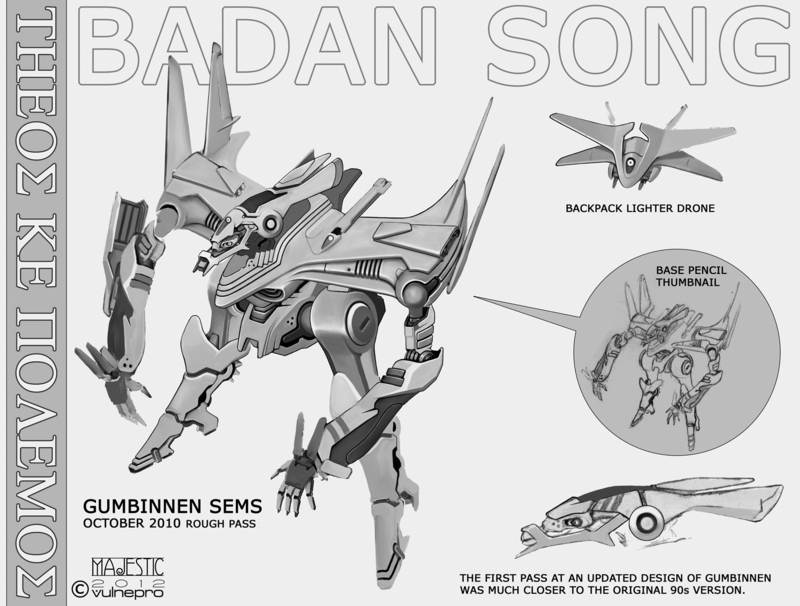 With Badan Song moving forward again Gumbinnen had to be sorted out because he's, more or less, one of the star sendai. I liked some of what was going on with the 2010 version (see above) but I just didn't feel it was there so it seemed starting anew was the way to go. During one of my laundromat sketch jams I cranked out a pile of Gumbinnen thumbs. Some examples are part of the thumb collection above. This batch of laundry thumbs landed in the place I wanted his make-over to go. As can be seen in the thumb collection there was a mix of more hard panel versions and some with a more mixed hard to organic surface approach. Ultimately the batch of revisions I began gravitating toward landed in a look that certainly evoked the original 90s design while bringing in the new 5th gen FOIL aesthetics and cues of TKP's mutated art deco. His limbs now had the distinct covered fabric/armor look the 5th gen FOILs employ (which makes sense as Gumbinnen would be created in the late 4th to early 5th gen period) along with various textures as well. Also his limbs have the familiar 5th gen connection port caps. These caps are simply covers for ports intended to connect additional armor, parts, weapons, etc (note the left shoulder armor on the finished design has one of these ports in the center without the cap cover). His body has various parts with a simulated deco bakelite texture (most distinct on his shoulder "grilles") evocative of the classic 40s deco bakelite radios streamline look. His legs begged for a decidedly reverse joint style which seemed to be more visually appealing and convincing at the same time. For his feet he got a unique squishy three toe design that would be movable like a real foot but far more resilient and strong. The gear featured on Gumbinnen, as displayed, is a fully flexible system of equipment that can be customized and modded to tactical and law enforcement situations as needed. The running studio brief joke, Nick, Karl, and myself have, regarding exploring this with combat sendai is "tacti-cool". Another words Combat sendai gear will be tailor made for al kinds of interesting combinations and weapon packs, add-ons, etc. On Gumbinnen's wrists, like the original design, he has two additional reverse toes. on the TKP version those toes also have built in lighters (tasers) for additional close quarters attacks. The long bars on his shoulders are additional sensor equipment, augmented smell, touch, etc. Also the top left sensor has a lock pick lighter and omni-link (Omnisense tap interface). 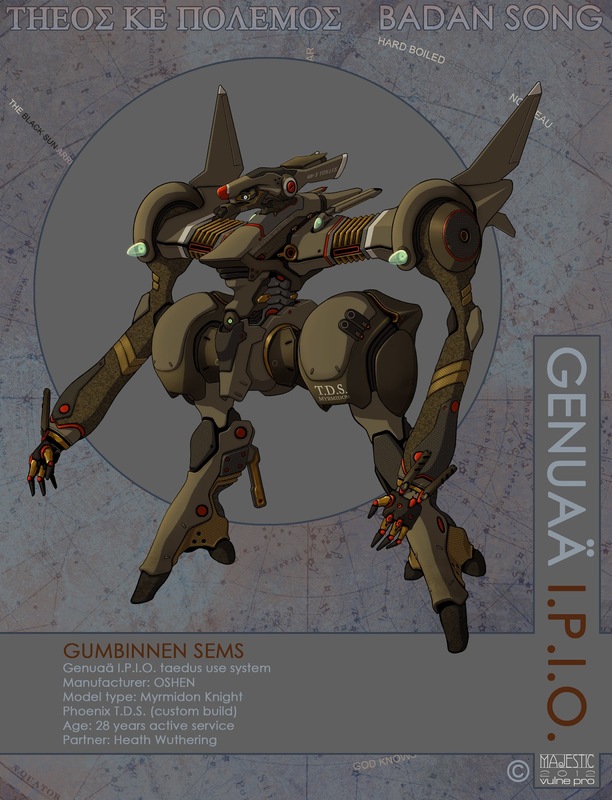 Gumbinnen has the capacity for flight, there is a small anti-gravitic Icar device that, like the FOILs, assists him in flying. Also, as with the FOILs, Gumbinnen can not access or repair this device on his own, it can only be serviced at an Oshen certified sendai repair/medical station. The use of the Icar devices is something more akin to breathing than a conscious consideration of it as a form of technology. Being it's commonly not understood how the devices work or who developed them it's simply not questioned. There are other secrets lurking within Gumbinnen beyond the mysterious Icar drive but that's for another time. That's it for now. It was fun exploring what really started all this sendai stuff in the first place along with visiting a character I created some time back when all this stuff was fresh and new to me. There's a lot of stuff baking behind the scenes so stay tuned... more to come.